Oriental models have for too long held sway in the UK pick-up truck market, a state of affairs that Volkswagen set out to change when they launched this Amarok model in 2011, then updated it in 2016. Big, economical and very capable, Volkswagen's off-road load-lugger was designed to give the Japanese contingent a few sleepless nights but originally boasted a 2.0-litre diesel line-up in a class where rivals had 2.5 or 3.0-litre units. Hence the development of a lustier six cylinder 3.0-litre TDI unit for this latest version claiming an effective mixture of power and efficiency. The result should be a very complete pick-up indeed. Pick-up sales may have taken off in Europe over the last decade or so, but the vehicles themselves have come almost exclusively from the Far East, Japan dominating the market with Mitsubishi's L200, Nissan's Navara and Toyota's Hilux, leaving Ford a few scraps to hoover up with their Thai-built Ranger model. So what kind of pick-up might a European brand design? How would it be different? In this Volkswagen Amarok back in 2011, we got our answer in a vehicle that's sold steadily since but has been ultimaely limted in its aspirations by the fitment of a 2.0-litre diesel engine that's smaller in size than the class norm. That's important as pick-ups need torque - and plenty of it. Hence Volkswagen's development of the new 3.0-litre V6 TDI unit for the improved Amarok model we're going to look at here. Like its predecessor, this is claimed to be the most car-like vehicle of this kind ever made. Potentially then, the perfect solution for SUV buyers who want the greater practicality of pick-up motoring. A tough ladder-framed chassis and a solid, leaf-sprung rear axle necessary to carry heavy loads offer the inevitably utilitarian feel. 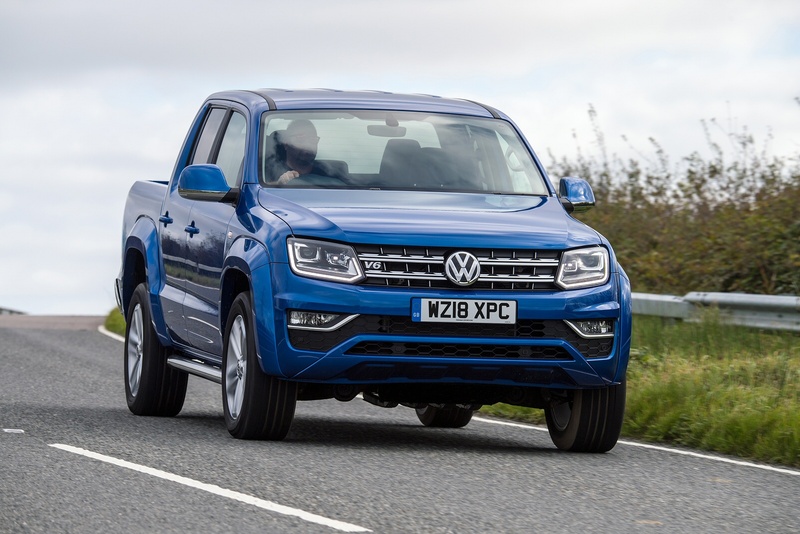 Within the confines of this approach though, the Wolfsburg engineers have actually done a very good job in making this Amarok as car-like as it reasonably could be. The introduction of 3.0-litre V6 TDI power means that there's nothing wrong with the performance now on offer, this unit available in three guises offering either 163, 204 or 258PS. The pokiest unit develops 580Nm of torque at just 1,500rpm. UK customers can choose from selectable (with manual gearbox) and permanent (with auto) 4MOTION four-wheel drive. An optional mechanical rear-axle differential lock is also available for demanding off-road use. On the road, this Amarok should feel sharper to drive courtesy of a new Servotronic steering system. Plus new 17-inch brake discs on the front axle and 16-inch discs at the rear ensure that this pickup always comes to a stop quickly and safely. As before, with a length of 5.25 metres and a width of 2.23 metres, this Amarok is a substantial thing. To reflect the changes made beneath the bonnet, Volkswagen's stylists have tried to give this improved version a more athletic-looking front end. As before, the chunky shape appears solidly planted to the ground with cleanly sculpted bonnet curves and a large Volkswagen emblem and grille, with clear horizontal lines linking them together across the front of the vehicle. Inside, there's a completely re-styled dashboard. Together with new ergonomic seats, these features aim to lend the vehicle a more sophisticated appearance. As before, there's neat switchgear, clearly defined instruments, a lovely three-spoke reach and rake-adjustable steering wheel and soft-touch plastics lifted straight from Volkswagen passenger cars. It's rather like being in a Golf on stilts and it'll be rather surreal if you come to this vehicle straight from an older pick-up rival. It's practical too, with lots of storage, including large bins in all the doors which can hold a 1.5-litre bottle in front and a 1.0-litre bottle in the rear. There's also a lidded bin, a lockable glovebox, a compartment for your sunglasses, two cupholders between the front seats and under-front-seat drawers on most models. In the rear, the extra width of the vehicle makes it easier to accommodate three adults if need be - though two will obviously be more comfortable. All will get proper three-point seatbelts and most trim levels include rear cupholders for their use. If the rear bench isn't in use and you need more storage room, you can tip the backrest forward to free up extra loadspace. The range is based around the Doublecab bodystyle that almost all UK buyers want and all models get the 3.0-litre V6 TDI engine in either 163, 204 or 258PS guises. There are three trim levels - 'Trendline', 'Highline' and 'Aventura', with the latter two needed for the top 258PS unit and ex-VAT pricing ranging in the £26,000 to £40,000 bracket. Equipment levels of course, depend upon the trim designation you have in mind, but whatever variant you choose, you'll find that all Amaroks come with most of the basics. That means things like alloy wheels, Climatic air conditioning, daytime running lights, all-round power windows, power heated mirrors, a 12v power socket, a CD stereo and a Thatcham Category 1 alarm and immobiliser. Plusher variants add things like cruise control, a trip computer and front foglamps. Going upwards on sharp inclines, there's a Hill Holder Clutch to stop you drifting backwards. Going down the other side, there's Hill Descent Control to keep the car at a steady speed. And of course there are plenty of accessories. These include a lockable toolbox designed to fit across the loadspace, a choice of tonneau covers or a complete matching hardtop to enclose the entire load area. If you�re looking for a new Volkswagen Amarok A33 Diesel D/Cab Pick Up Trendline 3.0 V6 TDI 204 BMT 4Motion for sale, you�ve come to the right place. At Bristol Street Motors we don�t just have the best Volkswagen Amarok A33 Diesel D/Cab Pick Up Trendline 3.0 V6 TDI 204 BMT 4Motion deals, we also offer friendly advice and help with all your enquiries to ensure your buying experience is a happy experience.